Summer is here and temperatures are rising! Summer is here and temperatures are rising. Your parked car can be a dangerous place for your pet. Even on cloudy summer days with the windows down a couple inches, the inside of your car can reach over 100 degrees in just minutes. While the weather may appear comfortable outdoors, the buildup of heat inside your car can kill your pet. Pets can die of heatstroke or suffer brain damage within minutes. During summer days, it’s better to keep your pet at home. However, if you have to bring them along, park in shaded areas, keep windows open, and only leave pets for a couple minutes. Keep your pet hydrated by providing adequate cool water. One tip is to freeze a bowl of water, which also avoids spillage. Don’t take a chance with your pet’s life. Keep them safe and cool this summer. This message is brought to you by Animal Services. 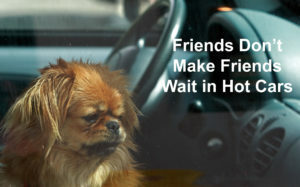 For more information, contact Animal Services at 360-352-2510 or visit www.JointAnimalServices.org.